The great Jack Davis, primarily of Mad fame, illustrated this nifty little ad. I can remember seeing it in the books I read when I was little (in the mid-80’s), long after some of the stars listed at the end had left the scene. I was a huge basketball fan (Magic Johnson was my main man), and I knew Dr. J, but I had absolutely no idea who the *bleep* Rick Barry was. Being a lanky, gangly white guy myself, perhaps I should have taken some inspiration from him. Totally agree with you on this one! I was — and remain — a huge basketball fan, and Dr. J was one of Little Me’s main hoops heroes (until Barkley came into the league; for some reason, short, chubby me took a fast liking to the Round Mound of Rebound). But I had NO clue who Rick Barry was. Of course, in our defense, this was long before ESPN Classic! 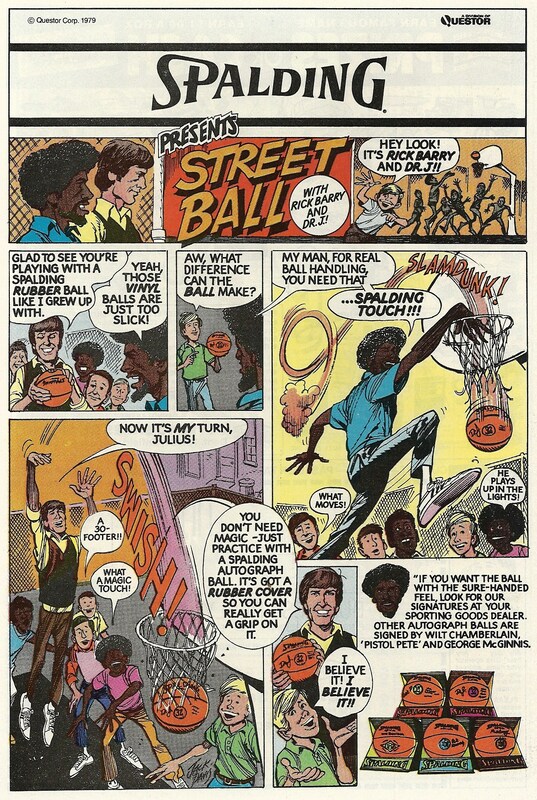 Man, can’t below Rick Barry is drawing blanks here. I think I’m only slightly older than Andrew at least, & I was not at all a sports fanatic (not back then nor now), but I totally knew who Rick Barry was – he played quite a few seasons with the Golden State Warriors and really was one of the better known players in the NBA during the ’70s, right up there with, yes, Dr. J. I even remember that he was popular, or perhaps notorious, for taking free throws underhanded and almost never missing. I’m well aware of who he is now, but when I was still in the single digit age bracket I had no idea. Now I mainly associate him with his basketball playing progeny — good hoop genes in the Barry family. Jack Davis is fine, thank you very much!